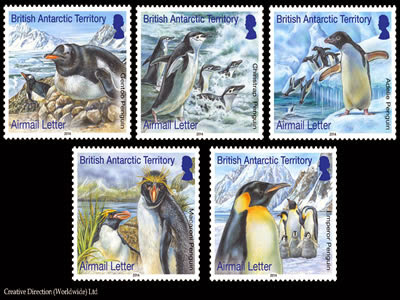 These stamps, illustrating the 5 species of penguin that live on the Antarctic, are available on reels as small self-adhesive postcard rate stamps and also in sheets, as larger gummed letter rate stamps. It is the letter rate stamps that will be affixed to the Official FirstDay Covers. Of the 17 different species of penguin the emperor and Adéliemake the Antarctic continent their true home, whilst the chinstrap, gentoo and macaroni breed on the northern tip of the Antarctic Peninsula, where conditions are less harsh. Penguins are the most common birds in the Antarctic with the total number of breeding pairs in the region estimated to be about 20 million. They were once thought to be the most primitive of birds. Members of Captain Scott’s famous expedition went on what they described as “the worst journey in the world” in the Antarctic winter to obtain an emperor penguin embryo to prove this point. But they were wrong — penguins are highly evolved to be able to live in the coldest of places. Whilst penguins cannot flythey have evolved into the most efficient swimmers and divers of all birds. Some species spend 75% of their time at sea and one female emperor penguin was recorded at an astonishing depth of 535m. As penguins are rarely seen underwaterour main impression of them is confined to how they appear on land. With their legs set far back for efficient movement underwater, the penguins walk awkwardly in a very upright position. This is possibly the reason for their extraordinary appeal — they look like funny little people. However, even on land penguins are surprisingly agile. They can travel vast distances on foot or by “tobogganing”, sliding on their bellies over the ice, propelled by their wings and feet. Some penguins are able to hop up great heights compared to their size. Penguins generally breed on exposed rock, beaches or tussock grass, with the exception of the emperor, which breeds on sea-ice. A healthy adult penguin on land has no natural predators, though eggs and chicks are eaten by other birds (skuas and giant petrels). Penguins usually live in places free of land predators, against which they would be defenceless. However, in water, penguins are hunted by leopard seals and killer whales. Leopard seals cruise the ice edge next to penguin colonies, waiting for the birds to plunge into the water. The penguin diet consists mainly of fish, squid and crustaceans. In the Antarctic, the smaller penguins mostly feed on shrimp-like krill. Although krill are small (up to 5cm in length) they form dense swarms which are a rich food source. Penguins can adapt their diet to what is available, and their diet varies considerably with season.